Ever want to add a line or two of text to a project but didn't because it's just too much of a pain? Don't want to invest in alphabet libraries? Hate lining up letters? Tired of stitching fonts that don't turn out regardless of how well they are stabilized? Afraid to install (and learn) yet another computer program? New Quick Font Lettering makes it easy! Whether you are font challenged, in a hurry, or just starting out and not sure which way to go with text embroidery, Quick Font Lettering is quick, painless, and inexpensive. No digitizing, image manipulation, or programming is required. Simply select the fabric type you are going to embroider, font size, and thread weight and the font density, stitch count, and underlay are adjusted to compensate-all for about the cost of a fast-food lunch. The program can be accessed at AnnTheGran.com, is easy to use and, when you are done, you have a file that can be stitched just like any other embroidery design. Just create it on screen, download, center it in your hoop, stitch it out, and save it for the next time. 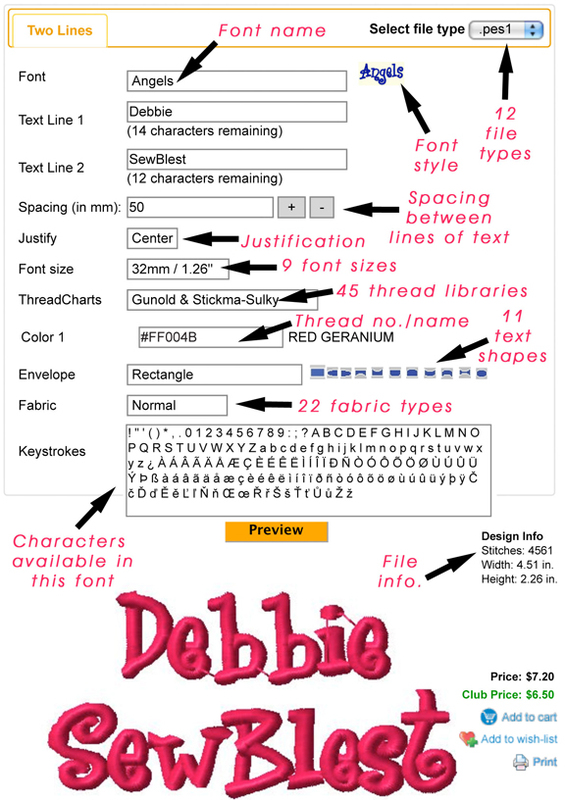 Choose from more than 375 different fonts in nine sizes. Font sizes range from 5 mm/.2" to 35 mm/1.38". There are 45 thread charts available. Text can be formatted in 11 different shapes. Twenty-two fabric types are offered. See all keystrokes available for each font. Preview the stitch-out to see how it will look before you buy it. A final stitch count and dimensions are calculated. Save it in any of 12 different embroidery machine formats. Choose left, right, or center justification. two-color text. I'm sure it will come in handy! I think that looks great. Looks like a good deal. I love this for those quick and unusual lines we sometimes need.